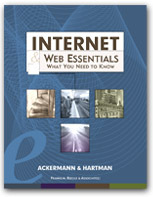 Internet and Web Essentials: FYIs: What's Cool - The Top 3%! - "Finding Email Addresses Trying to track down the contact information for friends or family? These tips and sites can help! There are many ways to track down people on the Web. For instance, many of the largest directories are international in scope and cover hundreds of thousands or even millions of people. At the same time, if you know something about the person you are looking for, such as their interests, professional affiliations or education history, you may be able to track them down through one of the many smaller, specialist directories. These directories generally focus on a single subject, such as alumni of a specific school, for example." - Ability to search or browse the database of over 40,000 public groups that use LISTSERV as the software to administer the discussion group. - By James Milles. Contains information about working with discussion lists, interest groups, and mailing lists. - A service you can use to read or search Usenet articles. - "The following list provides a guideline for you to follow in formulating search requests, viewing search results, and modifying search results. These procedures can be followed for virtually any search request, from the simplest to the most complicated. For some search requests, you may not want or need to go through a formal search strategy. If you want to save time in the long run, however, it's a good idea to follow a strategy, especially when you're new to a particular search engine. " - A list of file formats in alphabetic order by extension.